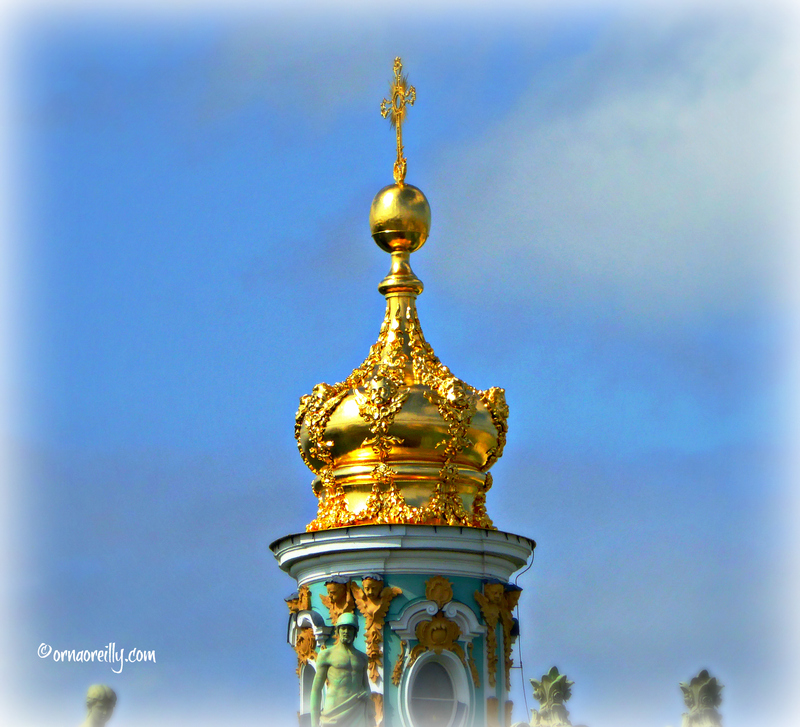 ‘All that glitters is not gold…..’ except in St. Petersburg in Russia, a city of six hundred palaces, where ‘all that glitters’ is indeed gold and where the shining domes and spires are actually covered in the real thing. St. Petersburg, being just a stone’s throw from the Arctic Circle, is dark for much of the year and it was decided that to lift the spirits of the inhabitants, the city should be full of golden domes and spires. Sometimes called ‘The Venice of the North’ with its 40 canals and 400 bridges, St. Petersburg was originally modelled on Amsterdam, a city also built on reclaimed swamp, which was much loved by Peter the Great who learned his ship-building craft there. Visiting Russia with Insight Vacations as their guest, along with fellow blogger and travel writer, Tom Weber, The Palladian Traveler, was a fabulous experience. 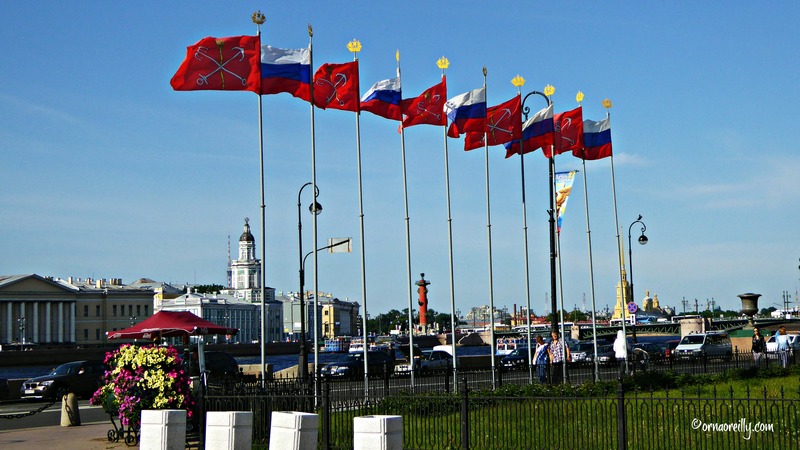 As well as the basic sight-seeing that is included in the Easy Pace Russia journey, we were asked to take part in all the Optional Experiences and to report on them, which we did with pleasure. 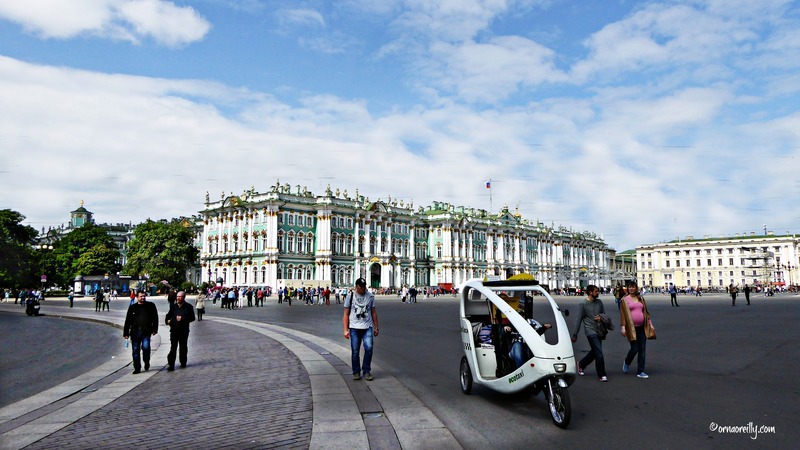 These Optional Experiences included: Neva River Cruise; Russian Folklore Show: brilliant with a break for Champagne; Catherine Palace: read my article HERE; Peter & Paul Fortress; Russian Ballet Performance in the Hermitage Theatre and a visit to the Yusupov Palace. Tom and I arrived in St. Petersburg on a sultry, overcast Saturday afternoon. Driving from the airport to the city centre by courtesy car, I was struck by the many, many blocks of flats along the way; evidence of a large population. After about half an hour, we arrived at our hotel, The Crowne Plaza on Ligovsky Avenue, 61, a stone’s throw from the romantically named Nevsky Prospekt, the main street of this bustling city. We loved the hotel with its friendly staff and our gorgeous room with snow-white bedlinen and all luxuries you could possibly want or need. Having travelled from Venice, we were tired that evening and decided to eat at the hotel. This was the beginning of our culinary adventures in Russia. 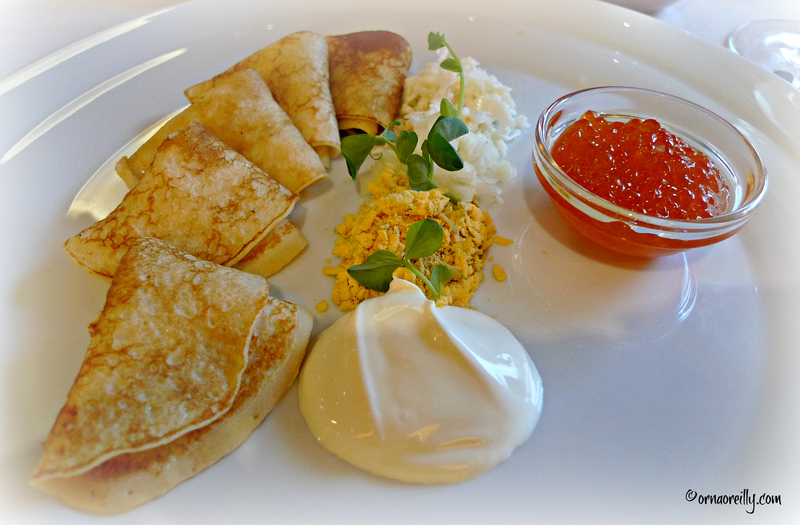 Read my article about Russian food HERE. Next morning, bright and early, we headed off to explore. My description of our day strolling on Nevsky Prospekt, with lots of photos, can be read HERE. That evening we were introduced to our Moscow born and bred Tour Director, Gennady, who looked after all of us wonderfully for the entire trip. Nothing was too much trouble for Gennady and he was always available as a fount of knowledge and information. 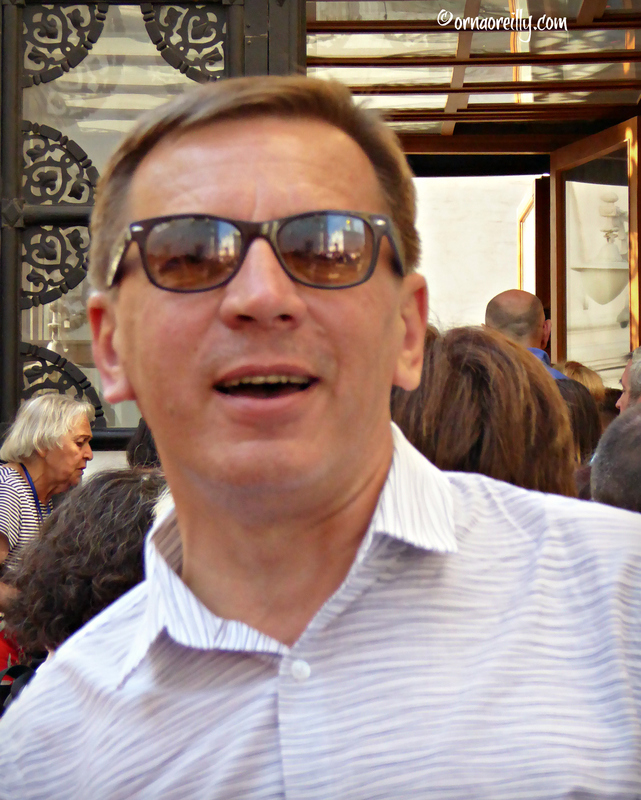 Gennady, in turn, introduced us to our St. Petersburg guide Gulya. A warm-hearted and humorous lady, I warmed to her immediately. Plus she turned out to be truly knowledgeable, sprinkling her narrative with details that could only be known to a true born-and-bred local. 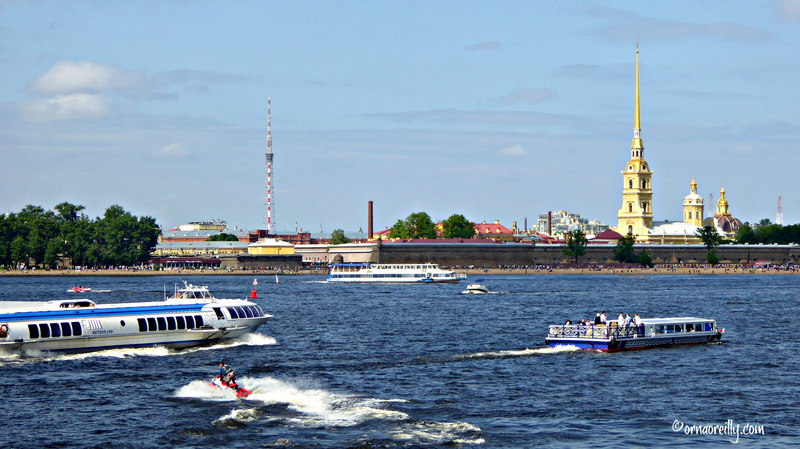 Climbing aboard our luxury coach, we were driven down Nevsky Prospekt and across the broad River Neva to Basil Island. 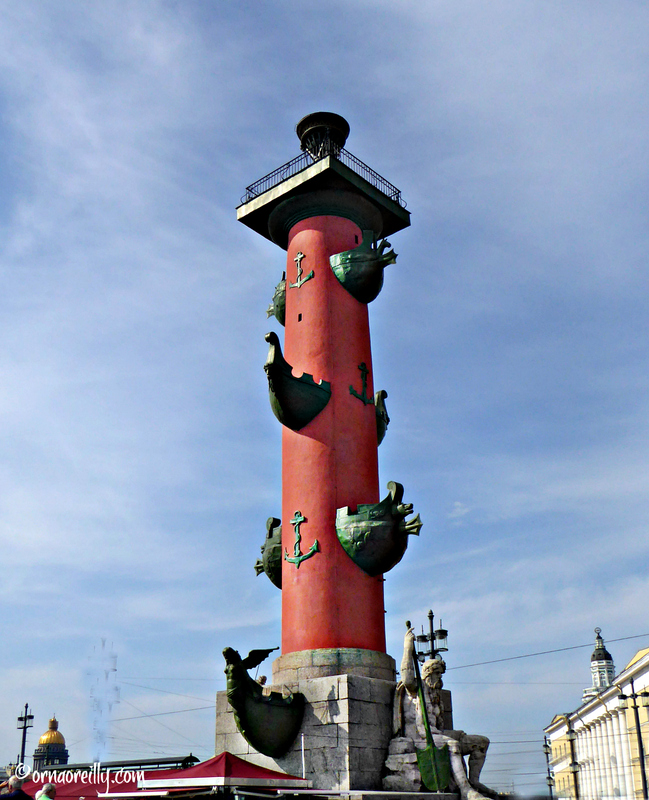 Here we saw the Rostral Columns, which commemorate naval victory, decorated with the prows of ships. Gulya told us how the bridges open at night to let the ships through, so you need to be home beforehand as it is possible to be trapped on the far side of the river if you are late. On occasion the temperature in St. Petersburg can drop to minus 40 degrees, though it usually hovers around minus 20 during a normal winter. According to Gulya, those who have to venture out during these cold spells smear their faces with mink fat to prevent the skin from cracking. As it rains and snows quite a bit and the city gets a mere thirty days sunshine on average per year, we were incredibly lucky to have been there for four of them as the temperature was an unusually warm 25 degrees during our visit at the beginning of June. We were also there for what is known as the White Nights, when it remains bright overnight in a slightly disorienting way. The five million people of St. Petersburg would appear to be pretty resilient lot, as the city was devastated by bombings, cold and hunger in WWII. Two million people died during the Siege of Leningrad, as it was called then, between 1941-45, but a proud boast is the fact that the Nazis did not actually manage to enter the city. As we cruised in our luxury motor coach through St. Petersburg, Gulya pointed out the historic Mariinsky Theatre, where the Mariinsky Ballet, Opera and Orchestra perform. 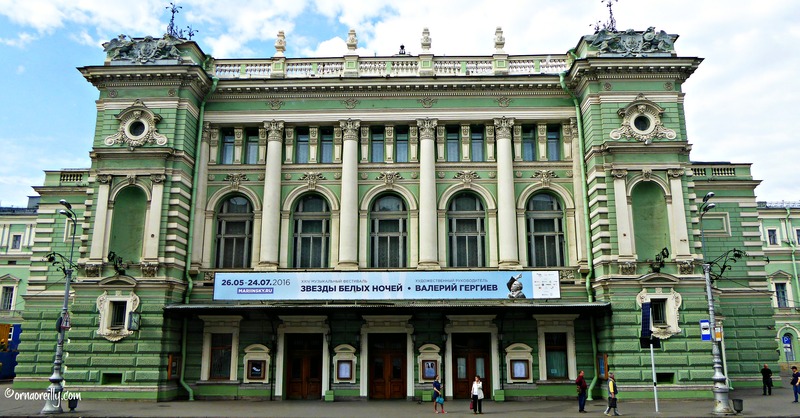 This famous theatre hosted such musical geniuses as Tchaikovsky and Rimsky-Korsakov. The Mariinsky Theatre is also famous in our family, as it is where my son proposed to his now-wife a couple of years ago. Apparently, he went down on one knee in the bar during the interval. Thank goodness she said yes! Stopping at The Church of the Spilt Blood, the site of the assassination of Tsar Alexander II, and St. Isaac Cathedral, we marvelled at the level of gold and ornate decoration incorporated into these spectacular buildings. Passing through Palace Square where the Winter Palace is located, we stopped to marvel at this ornate building and the wonderful column in the centre. 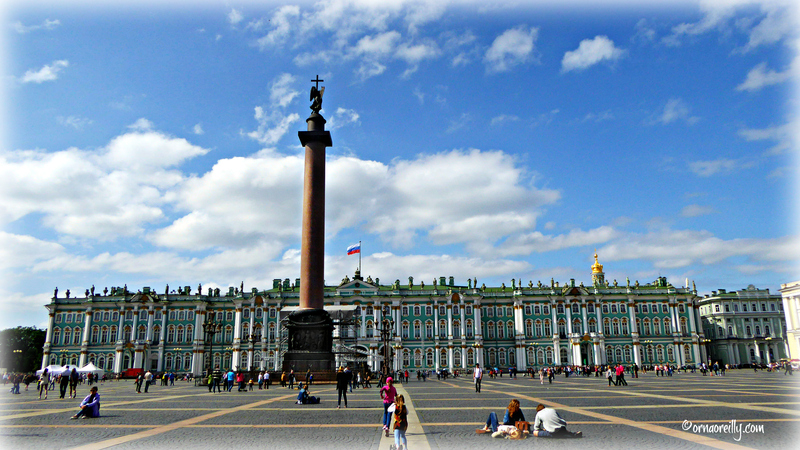 The Winter Palace houses the Hermitage Museum which were were scheduled to visit the following day. 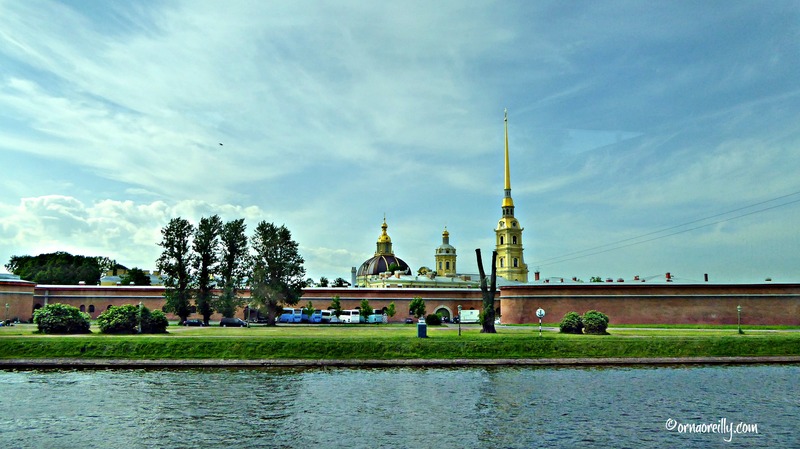 Driving along the banks of the River Neva……………. 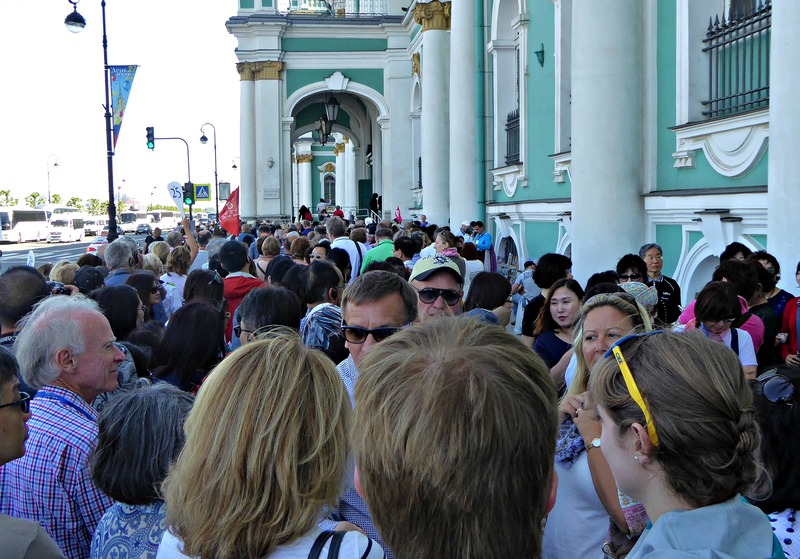 ……………..next stop was Peter & Paul Fortress. Constructed on Hare Island on the River Neva, it was the first building constructed in St. Petersburg in 1703. A prison for 200 years, it was – according to Gulya – a pretty terrible place to be incarcerated. The first prisoner there was Alexis, son of the first wife of Peter the Great, who was tortured to death and buried under a staircase. Other prisoners there included Dostoyevsky, Trotsky and Gorky, who were looked on as political prisoners. Inside the walls, the SS Peter & Paul Cathedral, with its spectacular weather vane, is the historic site where all the Tsars and their families are entombed, beginning with the babies born to Peter the Great and his wife Catherine, and finishing in 1998 with Tsar Nicholas II and his wife Alexandra, along with their five children and their servants, who were executed at Yekaterinburg in 1918. Since then, the remains of Nicholas II’s mother Maria Fedorovna were brought from Denmark and interred there beside her husband Alexander III. The old Mint is there too and the boathouse from where Peter the Great learned to sail. Our visit to the Hermitage Museum was pretty grand. Unfortunately, we were obliged to queue for over an hour before we were able to get in, but there was an air of camaraderie in the heaving queue where vendors offered us items for sale from guide books to fur hats. And inside the Hermitage Museum…..what beautiful ceilings and floors! Hermitage Museum. Large Throne Room. 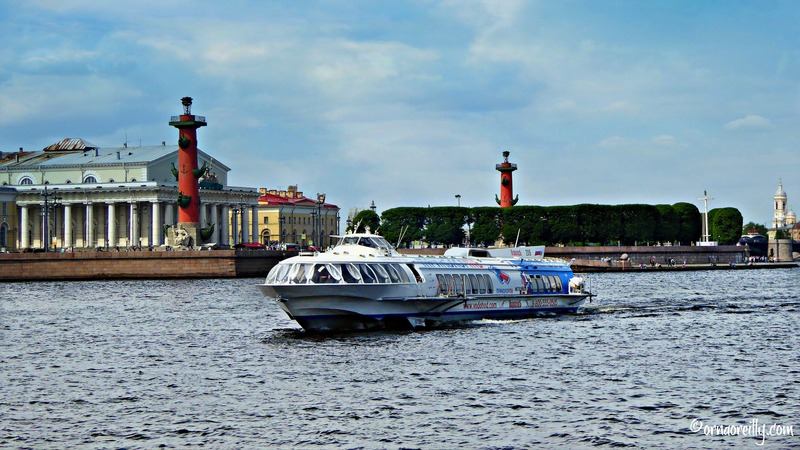 Next day a trip to Peterhof was on our agenda and we were brought there by hydrofoil along the southern shore of the Gulf of Finland. Disembarking, we were to see the most ornate palace and gardens imaginable. Modelled on the gardens of Versailles, this was the imperial residence of Peter the Great and was utterly breathtaking. 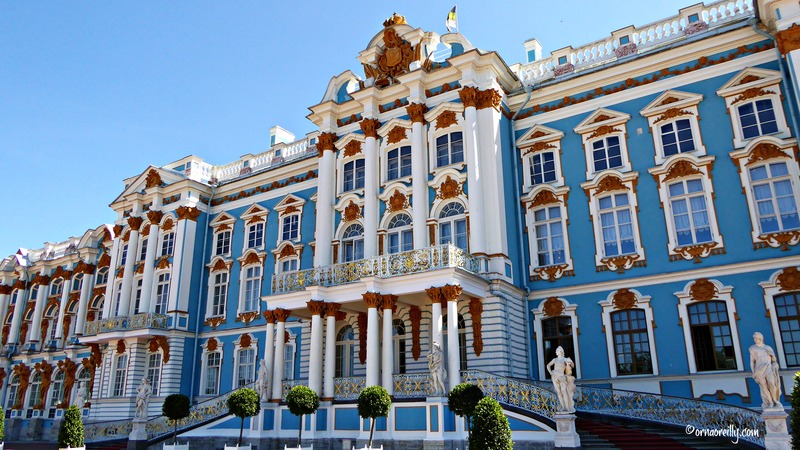 For further information about Peterhof and other sights of St. Petersburg, read Tom’s wonderful blog HERE. Our boat trip was great fun. Along the Rivers Fontanka and Moika – which means dirty – we also entered the busy River Neva for a while, then back to the Moika via the Ice Canal, so called as it freezes right to the bottom in winter. 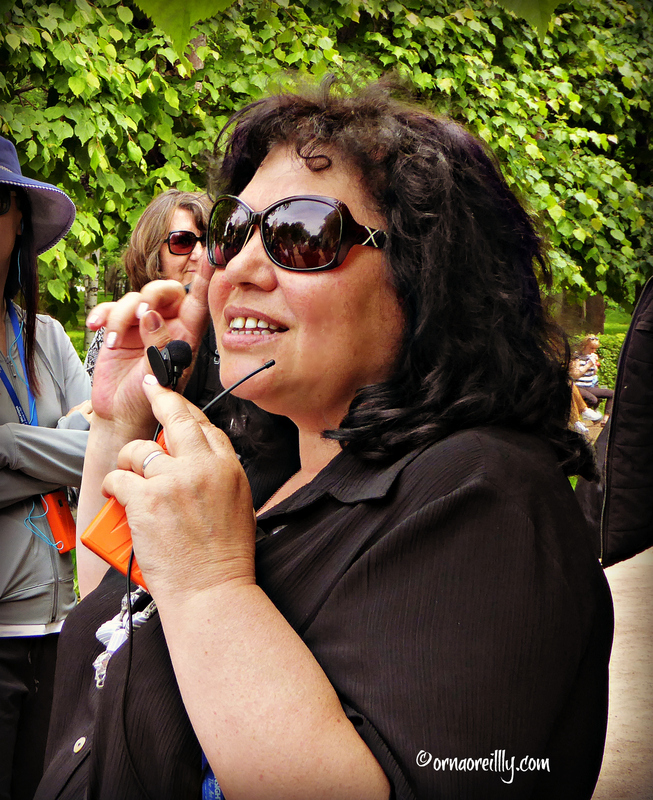 For me, the highlight of the trip to St. Petersburg was our trip to the Catherine Palace at Tsarskoye Selo. So much so that I wrote an article about it. Click HERE for details. On our final morning in St. Petersburg, we were brought to the magnificent Yusupov Palace, site of the murder of the infamous Rasputin by Felix Yusupov and some of his friends who felt that Rasputin was a real threat to Russia. The scene is recreated in waxworks set in the exact room where the killing took place. 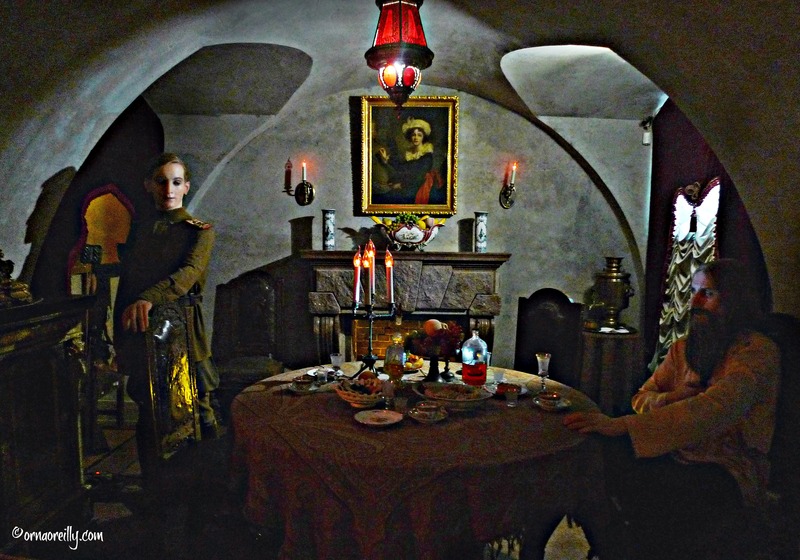 The wax figures representing Rasputin and Yusupov, in their setting of this small, gloomy sitting room are unsettlingly eerie. Rounding off our wonderful trip to St. Petersburg, we were driven to the railway station where we boarded the Sapsan high-speed train for Moscow. How I enjoyed my visit to the city of the golden spires! Nicely done, Orna. 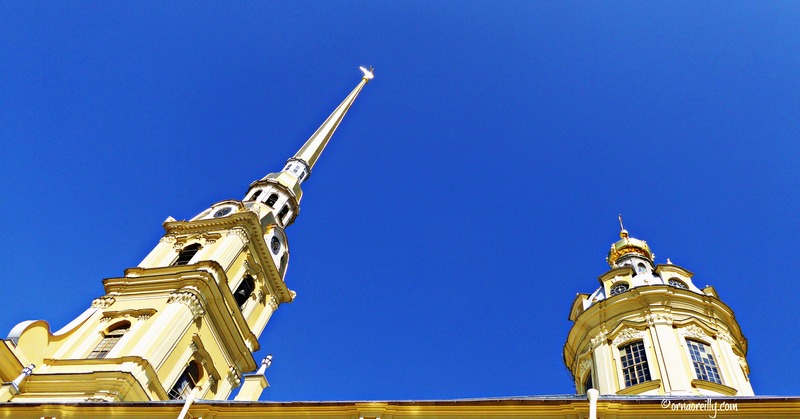 Your narrative and photos sweep us along and carry us all the way to St. Petersburg.